Birdman’s is at once a very simple story but also a very complex analysis. The story opens as Riggan Thomson [Keaton] mentally prepares himself to go on stage for the final rehearsals of his upcoming Broadway play. Riggan has been associated with a superhero (the eponymous Birdman) he played some twenty five years ago and hasn’t been able to really shake that role to attain the level of professionalism and respect he craves. With the success of the recent sway of superhero releases, he feels forgotten and believes this play – an adaptation of Raymond Carver’s ‘What we talk about when we talk about love’ – is his way back into circles of appreciation and recognition. The production of the play quickly becomes farcical as an injury wipes out one of the supporting roles and a last minute rehiring leads to the procurement of the acclaimed but unpredictable Mike Shiner [Norton]. As each of the preview performances is wrought with drama and absurdity, Riggan begins to meltdown desperate to escape typecasting by the industry and pigeon-holing by the public. And all the while a confident voice chants in his head that all this is beneath him and unworthy of the actor’s true potential as the greatest superhero of all time, destined for a comeback. The first and most obvious thing to note about this release is the manner in which it is presented. Everything from the single-take-esque structure to the story, to the performances draws a parallel with theatre; in addition to parallels with Carver’s story and Macbeth. Everything is backdrop for the characters to grow. Even the plot, to a degree, is just a device to serve conversation and character progression. That’s not to say there isn’t a story per se, more the narrative takes a backseat to the performances, it doesn’t really matter what happens, more how it is presented. As with any ‘behind the scenes’ feature, several acting clichés are played out but mercifully done so in a manner that is not only entertaining but somehow feels original. We have the manic insecure central performance, the erratic uncontrollable method actor, the starlet desperate for success, the panicking producer, the neglected girlfriend, the somewhat estranged recovering relation (daughter, in this case) and the overbearing menacing critic. It’s not anti-theatre but like any differing artistic mediums, there’s definitely an ‘us and them’ mentality that plays heavily throughout, much to audience amusement. As a film, it’s a very risky venture. The plot alone is such a simplistic one that without the powerful self-aware performances required, the entire project would fail. Thankfully, Birdman is perfectly cast in the sense that the roles portrayed mirror the public’s general opinion of how each respective actor seems to be (even if it’s a completely inaccurate view). One can only imagine the rehearsal time necessary to orchestrate this kind of release but despite rehashing the same delivery over and over without interruption, each member of the principal cast manages to evoke a spontaneity and energy necessary to make the events believable – again, a staple of any theatrical production. 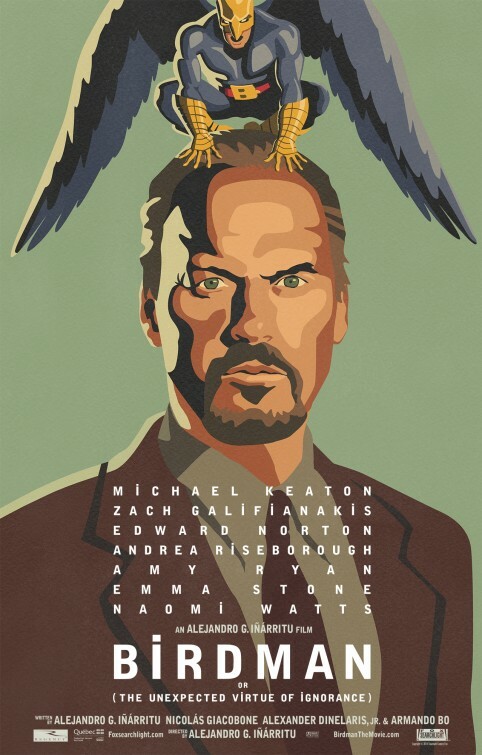 Leading the fore is Michael Keaton, reminding audiences that he is an acting talent to be reckoned with. It’s been several years since he’s starred in a leading role and it very much feels like his career has been building to this point. The man is a very gifted ad-libber and can deliver exceptional intensity or restraint with great ease, this movie simply shows off that ability. Thankfully, the praise doesn’t solely rest with the central character, with Ed Norton somewhat parodying himself as the abrasive, committed thespian who believes art requires more than just talent, one must live, love and breathe that role in order to convey any form of truth. Emma Stone is the next standout individual as Riggan’s standoffish daughter, born of the industry and immediately smothered by it. Recovering from addiction and hateful of those around her, Sam starts out as a generic two dimensional character but proves herself far more interesting and layered through her interaction with others. Same goes for Zach Galifianakis’ turn as the squawking lawyer/producer/best friend who appears both self-serving and genuinely concerned for Riggan’s interests, health and success. For all the good they do, Naomi Watts and Andrea Riseborough felt just a tad underdeveloped. I understood where they were coming from and what their characters hoped to achieve but they never really evolved out of that, lacking a conclusion to their base presence. The nature of the ‘single shot’ style that Inarritu and Emmanuel Lubezki developed could easily have surpassed the story or the characters and the functionality of how the film was made would dwarf what the film was trying to show. Thankfully, this is far from the case and the manner in which it was shot simply feels like any other artistic method of visually presenting events. In a way, this is just another example of the exceptional subtlety utilised throughout this release; from the lighting, to the camera movements, to the sound design, to the minimalist but very present CGI, aspects that can be garishly forced down an audiences’ throat were implemented with care and consideration for how they would enhance the performances, rather than take centre stage and overwhelm them – which is one of the movie’s critical messages of contemporary releases. But for all this positivity, the film falls short of perfection for one or two simple issues. I applaud the surrealism and the denouement but the whole thing comes off just a little too heavy in pop cultural references. I appreciate this film is an analytical breakdown of the current state of cinematic success but while plucking out names of actors and features will feel cutting edge, relevant and on-the-mark now, these elements will no doubt age the film. Having said that, one could argue that this movie is in fact a time capsule piece, taking a snapshot of the era of its release; a timeless précis of the evolution of acting in the early twenty first century. Only time will tell. Whether this movie holds up in years to come, it is undoubtedly a fresh and wonderfully original release, which has rejuvenated not only a few careers but reminded audiences that cinema doesn’t have to be limited to funny, sad, tragic or any other singular description. It can be a glorious mess of colour and tone and still come out as a readily identifiable piece of human analysis. The self-referential nature and play-within-a-play that mirrors the narrative makes it a little tricky to single out a standout scene, especially as the scenes never really stop, only momentarily inhale. Part of me really enjoyed the interaction between Riggan and Tabitha Dickinson, a theatre critic with the power to make or break any Broadway release. She openly confides to Riggan that although she hasn’t seen his rendition, she resents him for thinking he can waltz into her turf/medium without any form of theatrical training and expect to be loved. It’s a very unfair argument and highlights both the snobbery of the theatre industry but also the arrogance of the film industry – not to mention the performances feel vivacious and real. To highlight anyone outside of Michael Keaton would be criminal. This film is stocked from wall-to-wall with mesmerising performances but Keaton makes us genuinely believe every second of his portrayal. It is reasonably well documented that the character of Riggan couldn’t be further from Keaton’s personality or mindset but his delivery and mannerisms are so utterly convincing that you would never know any different – which, at its basest of elements, is the very nature of acting. Posted on 2nd January 2015 28th April 2015 by Matthew Stogdon	This entry was posted in Reviews. Bookmark the permalink.